Rank #1: FINANCE & INNOVATION - Show me the money! Rank #2: THOUGHT LEADERSHIP – Linda Greer believes in radical transparency! Linda Greer, Senior Scientist at the National Resources Defense Council (NRDC) joins Mike Schragger online from her office in Washington, D.C. to share her experiences working to improve the apparel sector, her initial ideas for creating a climate roadmap for apparel and her conviction that transparency as it is practiced today is not effective enough. This lengthy interview is full of nuanced opinions and advice for you sustainability change agents. Produced in collaboration with Ecotextile News. Rank #3: INNOVATION – Akshay Sethi is convinced that all of our clothes will be made from recycled materials by 2030. Mike Schragger talks to the smart and savvy Akshay Sethi about the science behind polyester recycling, the rapid development of the his company Moral Fiber, the steep learning curve he has faced when starting a company directly after graduating from university, and his conviction that all of our clothes will be made by recycled materials by 2030. This podcast has been produced in collaboration with Ecotextile News. Rank #4: CLIMATE CHANGE – Are you and your company serious about helping to solve the global climate crisis? Rank #5: INNOVATION – Style Lend & Good On You are betting that they can improve your consumer behavior. What if customers could improve the environment and make money by renting out their clothes simultaneously? And whom do you trust to provide an honest assessment about the ethical and environmental performance of apparel products and the companies behind them? Mike Schragger talks to Lona Alia from Style Lend and Sandra Capponi from Good On You, two entrepreneurs who believe their solutions will empower customers and drive change. This podcast has been produced in collaboration with Ecotextile News. If you are new to the field of sustainability and/or fashion and apparel and want to quickly up get up to speed, then this podcast is for you. 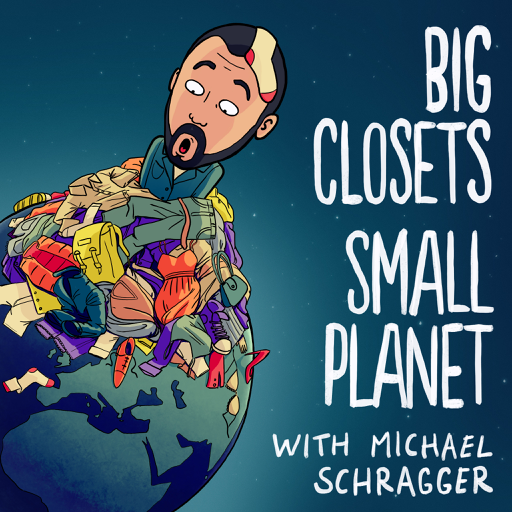 Mike Schragger, the host of Big Closets Small Planet, uses these 12 minutes to explain why we need to completely transform how we produce, use and dispose of fashion and apparel - before its too late. © 2019 OwlTail All rights reserved. OwlTail only owns the podcast episode rankings. Copyright of underlying podcast content is owned by the publisher, not OwlTail. Audio is streamed directly from Michael Schragger servers. Downloads goes directly to publisher.